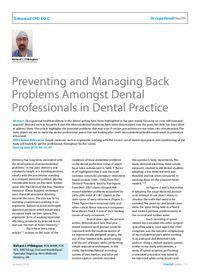 Abstract: Occupational health problems in the dental setting have been highlighted in the past mainly focusing on cross infection and acquired illnesses, such as hepatitis B and HIV. Musculoskeletal problems have been documented over the years but little has been done to address them. This article highlights the potential problems that may arise if certain precautions are not taken into consideration. The main objectives are to make the dental professional aware that not looking after one’s musculoskeletal health could result in premature retirement. Clinical relevance: Simple measures such as ergonomic working with the correct use of dental equipment and conditioning of the body will hopefully aid the professional throughout his/her career. Author notes: Richard J J Pilkington, BDS, MBBS, FDS RCS, MRCS(Eng), Oral and Maxillofacial Specialist Registrar, West Midlands Deanery, UK. Objective: To guide the dental professional through prevention and management of back problems with the aid of ergonomic working, correct use of dental equipment and conditioning of the body.